← 2018 Red Ribbon Cracker is Now Available! The recently-released Moving Rooms feature has now also been added to the Webkinz mobile app! IT’S FINALLY HERE! 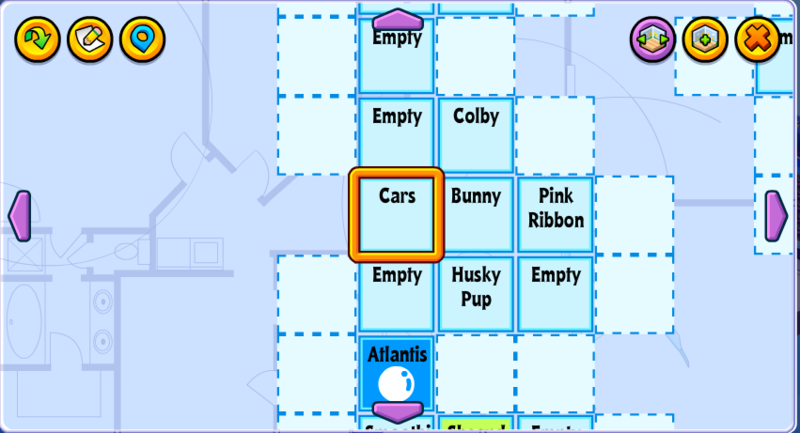 The ability to move rooms around on your Webkinz House Map! Have you been frustrated with the large and sprawling layout of your House Map? We’ve now added a “Move Room” feature which will allow you to re-arrange your rooms and make them more manageable! Just look for the NEW “Move Rooms” button next to the “Add Room” button on your House Map. Moving rooms works similarly to adding rooms. Once you toggle the moving rooms mode ON, you will see all of the highlighted options where you can move your room. The one rule is that all rooms must remain attached to your house by at least one wall, so you cannot start splitting your rooms up into separate islands. 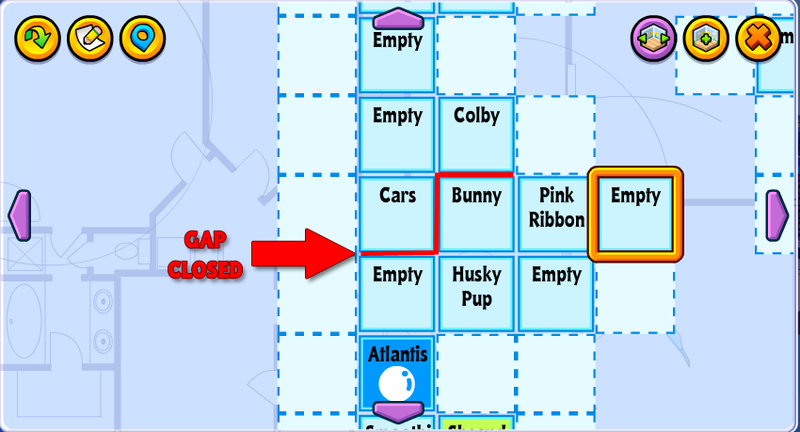 If you move a room and create an island, the House map will automatically close the gap, re-connecting the room(s) to the main map. Don’t like the location of a door in your room? Now you can move that room to another part of your map and attach it by a different wall, which in turn will change the location of the door. If the doorway between your rooms occupies the same spot as a wall decoration, that item will automatically be sent back to the NEW tab of your Dock. If your pet is standing in a doorway that is removed after you move a room, your pet will still appear floating in the same place, but then you’ll be able to walk them into the room from that spot afterwards. 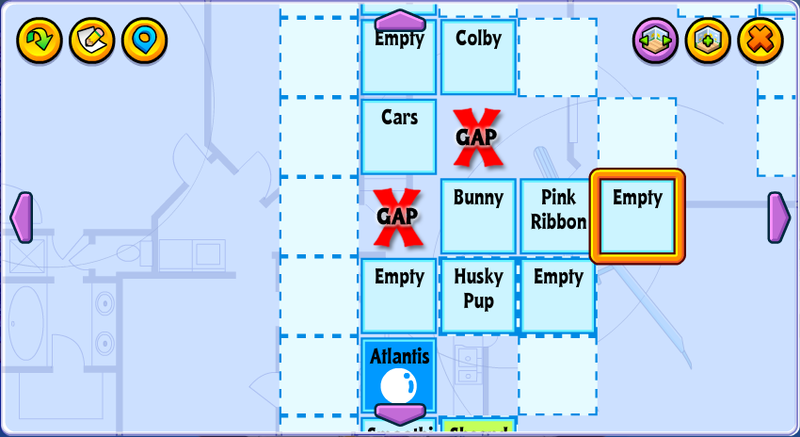 The ability to completely delete a room is still planned for sometime in the future, but for now this feature should finally give players much more control over the layout of their Webkinz houses! Don’t have the Webkinz mobile app yet? It’s available to download for FREE at both the Google Play Store and the Apple App Store! 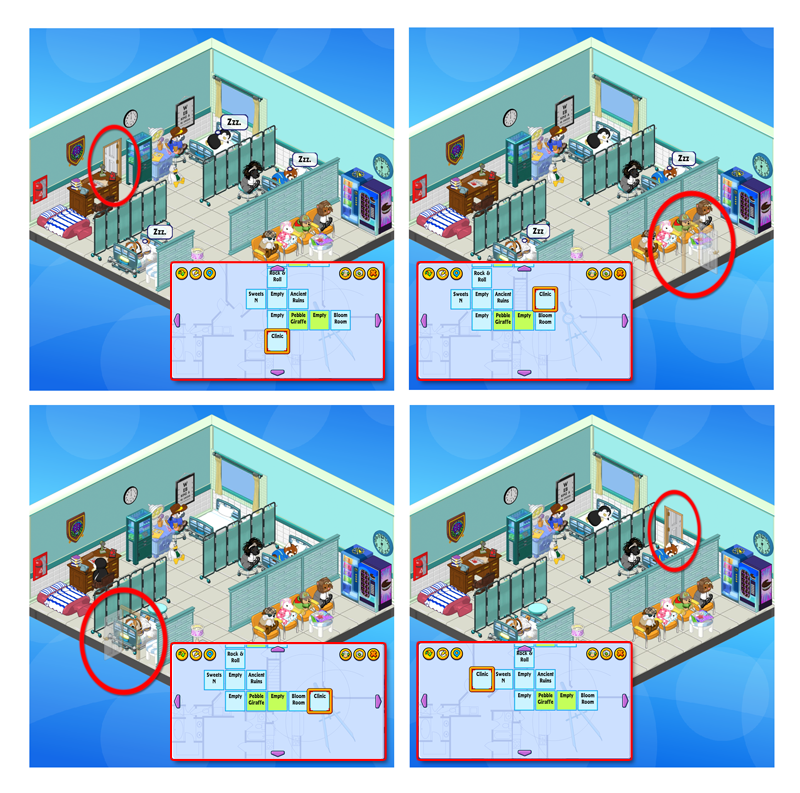 Have YOU been moving rooms around in your Webkinz house? Let us know in the comments below! 38 Responses to Moving Rooms on Mobile! I Love, Love, Love being able to move my rooms. Thank you so much Ganz for enabling this feature for us!!! I can’t say thank you enough for the room feature. I doubt I’ll use on mobile because it’s just too hard to do anything there, but it’s nice that the option exists and again, moving rooms is AMAZING! Are you working on being able to take doors out completely if we don’t want them? It would be great if we were able to place a door off-center in a room. thank you! Now will you also give us the ability to upgrade small rooms to larger ones please??? My Sand Dune Buggy just got stuck in the door in my house. =( How can I get it out? Foxes Rules 612, Can you please elaborate on what Webkinzsupport had to say? I have had this happen many times since the Moving Rooms transition. I have to keep sending my pet back and forth between the two rooms where the vehicle gets stuck, often up to five times before the pet actually sits in the car and it can be moved. What you do is move the room to a part where the door it’s stuck in becomes a wall. The car will automatically pop into your dock. Then you can move your room back to where it was. Much faster fix than waiting for customer service to unstick it. Don’t ride cars into other rooms and don’t jump to another room via the map, because the same thing happens. But touring your house while riding in a vehicle earns pet care when you’re short those last few points to fill up a pet’s heart :( Also yes, I did just get my car stuck in a doorway, but not until returning to the same room I started from. Had to log out, log back in, walk through the doorway, walk back to the first room, and now my pet is back to driving their bumper car. I’ve never had this problem before, since the move room feature was added is the first time I have had a car get stuck in a doorway. For some reason the rooms on the mobile app have glitched on me? I rearranged my house and now most my rooms have disappeared. I tried closing and reopening the app but I still can’t see my rooms. Why does it do this? Calicomania, I have this same problem on my mobile app! :-( I hope Sally Webkinz will read this and have someone check on it for us! It’s really annoying! Thanks for letting us know. I’m going to avoid rearranging on mobile until I hear if this issue has been resolved. I rearrange via the app all the time on my ancient iPhone 6s. Never had a problem. On mobile, my rooms have been shuffled all over the place. I was in a panic! But on PC, they are all in ABC order, where I left them. I wish there could be an “undo” button, for when an “island” is accidentally created and the whole house re-forms into something unfortunate. I have LOVED being able to rearrange my WW space. I adore it even more now!! I would rather be able to delete doors than delete rooms, really. Especially since we have the Rooms with a View. Who says just because two rooms are next to each other that they have to share a doorway? The doors ruin the rooms with a view. At least now we can rearrange, which does help tremendously.